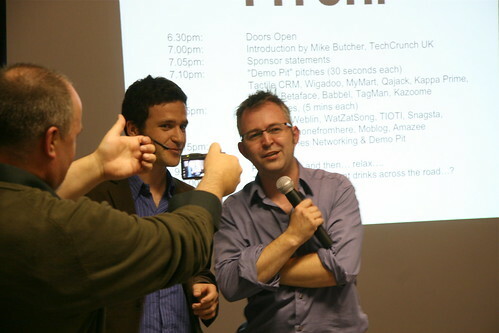 WatZatSong wins TechCrunch Pitch! event in London! That was a nice surprise. First to be selected to compete at the TechCrunch Pitch! event taking place in London, as a French startup. Second, to win the competition in front of very interesting projects. 9 startups were given 5 minutes each, and 10 others only 30 seconds, to introduce their project over different aspects (business model, competition, distribution…). We believe that what made WatZatSong win yesterday evening was the simplicity of the concept, as well as the stunning performance of the community what I would like to thank all the members for. WatZatSong, as a community search engine, gives stunning results. And all the testimonials of members having fun helping each other makes us believe that everyone is finding something in WatZatSong! You can find the video of my presentation thanks to moblog here. Big thanks definitely go to Mike Butcher from TechCrunch UK for organizing the event, all the people that came yesterday to listen to the pitchs and get in touch with the speakers and the other startups with whom it was very nice to have a chat! and I’m sure I’m forgetting some of them! The Live Quiz is now continuous! Anytime of the day, you can join in one of the quiz rooms of specific styles like pop/rock, reggae, r’n'b, jazz and compete in a big live music quiz against other players! You also have 2 rooms per styles corresponding to two difficulty levels to make it interesting for every player. See you soon for a music quiz in the Live Quiz section! Live Music Quiz have been running of the French Version for a while now. It’s now coming to the English Version! The Live Music Quiz is a real-time multiplayer game in which you need to name 30 seconds samples as fast as you can! It also has a chat for you to interact with the other players and you can add your motto to make it more personal! There is now one Live Music Quiz every hour. Most of them are 20-song long and of a specific genre, but 4 times a day you have a “Big Music Quiz” made of 50 samples of all kinds! Come out and give it a try! See the full Live Quiz program for the next 24 hours! A small Music Quiz to see how Disco learned you all are! Raphael was at Startup Camp in London to present WatZatSong and meet with some entrepreneurs from the Uk and a few other countries. This was a great opportunity to participate in a cool event outside of France and Sun, who organised it, did a very good job. Welcome to the English Blog of WatZatSong, the worldwide community that would identify any tune you may hear! Hope you will like it. Feel of course free to write comments and let us know what you think about our articles and WatZatSong.com!